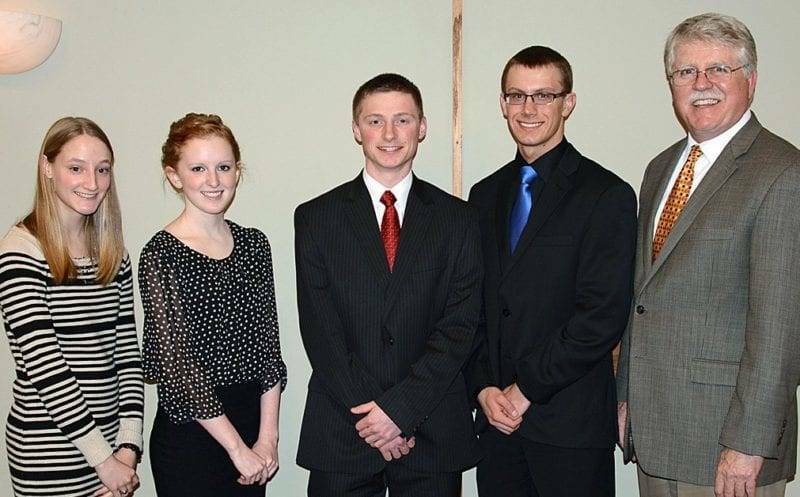 SCHOLARSHIP … Louise Freeland Scholarship winners Emma Northeim, Emily Johnson, Ryan Abbott and Blaine Thorp were recognized by OREC Vice President of Statewide Services Ken Keylor at a March 18 banquet held in their honor. COLUMBUS, Ohio – Emma Northeim of Amherst, Ohio, Emily Johnson of Casstown, Ohio, Ryan Abbott of West College Corner, Ind., and Blaine Thorp of Montpelier, Ohio, took top honors in the Ohio Rural Electric Cooperatives, Inc. (OREC) Louise Freeland Scholarship program, each earning $2,370 toward their college educations. Northeim is the daughter of Scott and Joy Northeim. Her father is a mapping technician for Lorain-Medina Rural Electric Cooperative in Wellington, Ohio. A senior at Firelands High School, she is active in FFA, National Honor Society, cross-country, bowling and track. She plans to attend Bowling Green State University to major in early childhood education. Johnson is the daughter of James and Krista Johnson. Her mother is an operations coordinator at Pioneer Electric Cooperative in Piqua, Ohio. She is a senior at Miami East High School, where she is active in FFA, National Honor Society and 4-H. She plans to attend Urbana University, majoring in business and marketing. Abbott is the son of Julie and Brad Abbott. His mother serves as human resources administrator at Butler Rural Electric Cooperative in Oxford, Ohio. He is a senior at Union County High School. He participates in Student Council, the Engineering and Technology Association, National Honor Society and soccer. He plans to attend Rose-Hulman Institute of Technology, Purdue University or Trine University to major in mechanical engineering. Thorp is the son of Su and Darin Thorp. His father serves as manager of North Western Electric Cooperative in Bryan, Ohio. He is a senior at Montpelier High School, where he participates in the National Honor Society, Robotics Team, Science Olympiad, basketball, golf and track. He plans to attend The Ohio State University, majoring in biology. Louise Freeland scholarships, named for a long-time employee of OREC, are awarded annually to the children of electric cooperative employees and trustees. A panel of independent judges reviews the applications and interviews the finalists before deciding on the winners. Be the first to comment on "Children Of Electric Cooperative Employees Earn $9,480 In Scholarships"